The fake news phenomenon has caused damage to the credibility of media houses who publish dubious stories. With media trust at an all-time low, journalists need to become critical when tracing the origins of suspicious information in order to slow down the trajectory of a lie. Circular reporting is one of the most common ways in which journalists aid the spread of fake news. Circular reporting is where a piece of information appears to come from numerous sources, but, in fact, comes only from a single source. This is often the way in which fake news in spread. Circular reporting can occur when, for example, publication A puts out a piece of false information and publication B reprints it. Publication A then cites B as the source of the original information. It is also considered to be a form of circular reporting when multiple publications all report from the same piece of false information. This information then appears, to another author, to be verified by multiple authors. This can make the tracing of sources nearly impossible. Satirical articles are also mistakenly picked up and published as factual. In a TED Talks video, Noah Tavlin explains that the need for instant gratification can hinder the search for truth. People would rather know information instantly, instead of ensuring the certainty of the facts. Who does circular reporting affect? Journalists, media houses and information consumers are all affected by circular reporting and fake news. Journalists are required to be increasingly aware that cited information may not, necessarily, be true and, in order to avoid being discredited, media houses must ensure the information they publish is correct. To stop the spread of fake news, consumers also need to take matters into their own hands and ensure information is correct before sharing it. Ylva Rodny-Gumede, head of journalism at the University of Johannesburg, says that it is not only journalists who struggle with circular reporting. Websites that contain high levels of user-generated content, such as Wikipedia, have been widely criticised for contributing to the cycle of circular reporting. If a user publishes a piece of information on Wikipedia, and a journalist uses that information in a published article, the initial user who published the information on Wikipedia can then cite the article as the source of information – making a false piece of information seem true. As more writers come to rely on such quick information, an unverified fact on a wiki-page can easily make its way into a published article – which may then be later used as a citation for the very same wiki-page. This makes it much harder to debunk false information. Stopping the spread of fake news involves ensuring the integrity of the information you use, cite or share. Anim van Wyk, editor of the fact-checking organisation Africa Check, says that the problem with circular reporting is that it completely erodes the trust that consumers have in journalists. Rodny-Gumede says that the way forward is to work according to what she calls a ‘journalism of scaling back’, where facts and sources are triple checked and if the source does not seem fully credible, the story should not be run. She further explains that the demand for information drives journalists to be highly competitive, which can lead to the spreading of fake news, for want of not missing out on a story. Van Wyk says that although Wikipedia can be a good starting point to get to grips with a subject, it should never be used as a source or quoted as such. He says that contacting sources directly is always the best way forward. 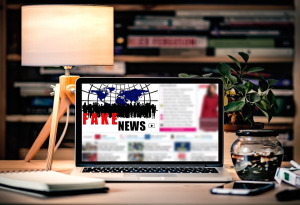 In order to stop the cycle of circular reporting, journalists, content producers and media consumers need to be more aware of the information they receive and call out others when they publish fake news. Rodny-Gumede echoes this sentiment, saying that although the media landscape has changed and that the internet lends itself to the spread of fake news, this also offers journalists an opportunity to evolve. She further explains that in order to crack down on fake news, a greater level of media literacy is necessary.